Domov » Wealth of local communities – How to keep the money within the local economy? Wealth of local communities – How to keep the money within the local economy? What can municipalities do to create value and keep the money in the local economy? 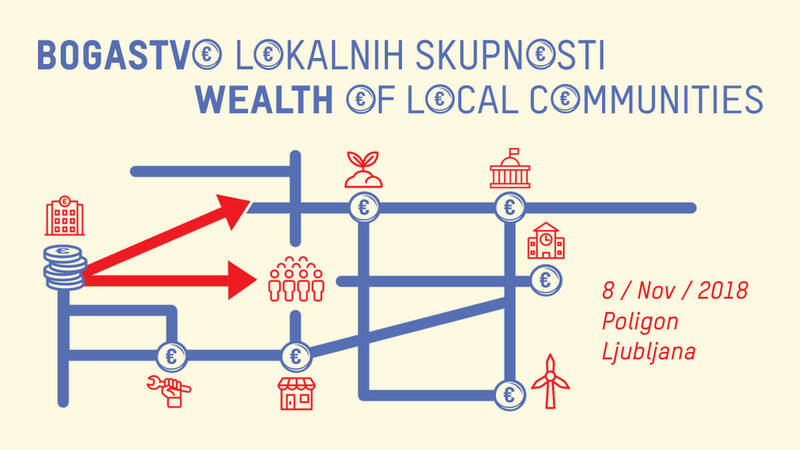 Join us at the international conference Wealth of local communities on 8 November 2018 in Poligon in Ljubljana. Many places struggle with local service providers and food producers closing their businesses followed by unemployment and numerous social and environmental consequences. Globalization is not necessarily beneficial for the local economy, so we often hear about places that have opted for development that builds on local potentials. Public procurement with local providers as well as the development of local services, jobs, and local currencies are approaches that can strongly contribute to the creation of wealth in a local environment. The key is to keep money as close to home as possible. Neil McInroy from CLES (The Centre for Local Economic Strategies, UK) will present their experience with encouraging local wealth building in Preston and other UK cities as well as their work throughout Europe in URBACT Procure network. Annet van Otterloo from Afrikaanderwijk Cooperatie (Rotterdam, The Netherlands) will talk about strengthening the resilience of Rotterdam South with investing in active inhabitants and local businesses in Afrikaanderwijk. 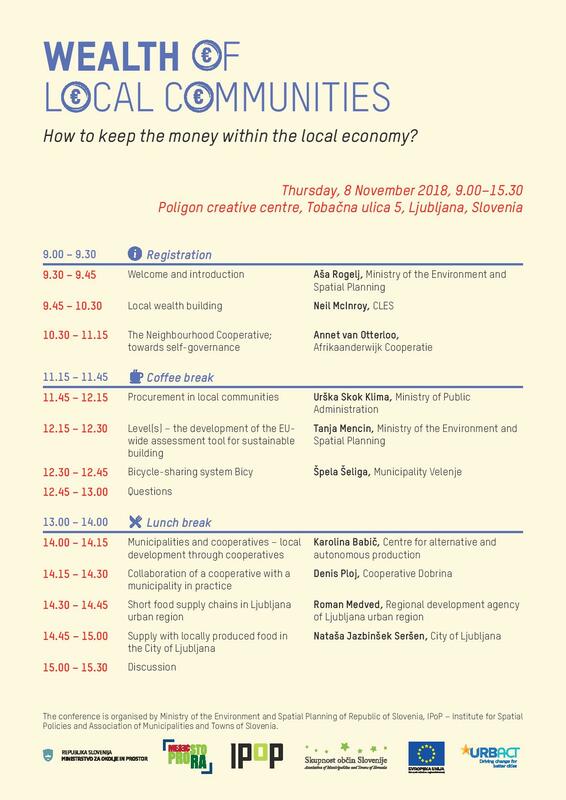 Apart from the interesting examples from all over Europe we will also hear about good practices from Slovenia and discuss how municipalities can promote local wealth building using the resources at their disposal. Join representatives from national institutions, regional, and local administrations, experts, NGOs, practitioners, and researchers from academic and research institutions at the conference. Attendance is free of charge, but the capacities are limited, so register as soon as possible. The conference will be held both in Slovenian and English with simultaneous interpreting provided. The conference is organised by Ministry of the Environment and Spatial Planning of Republic of Slovenia, IPoP – Institute for Spatial Policies and Association of Municipalities and Towns of Slovenia. Annet van Otterloo studied History at Leiden University (NL). She has a broad experience in in (art) projects in public space and community-led city development. Within the studio of visual artist Jeanne van Heeswijk she worked on several projects as a researcher, writer, producer and project manager. With Urbaniahoeve, Social Design Lab for Urban Agriculture, Annet worked on building a Foodscape, an edible, ecological infrastructure in The Hague. She works in a consortium with architects and contractors on social sustainability during renovation processes and is the project manager for the Freehouse Foundation. Freehouse creates space for encounter. It stimulates local inhabitants and shopkeepers, youngsters, artists, and designers to exchange knowledge, experience, and ideas. The connection of cultural with economic capital results in co-productions that mutually benefit participants socially, and economically. The Neighbourhood Cooperative; a cooperative on the scale of the neighbourhood is one of Freehouse’s most important projects. 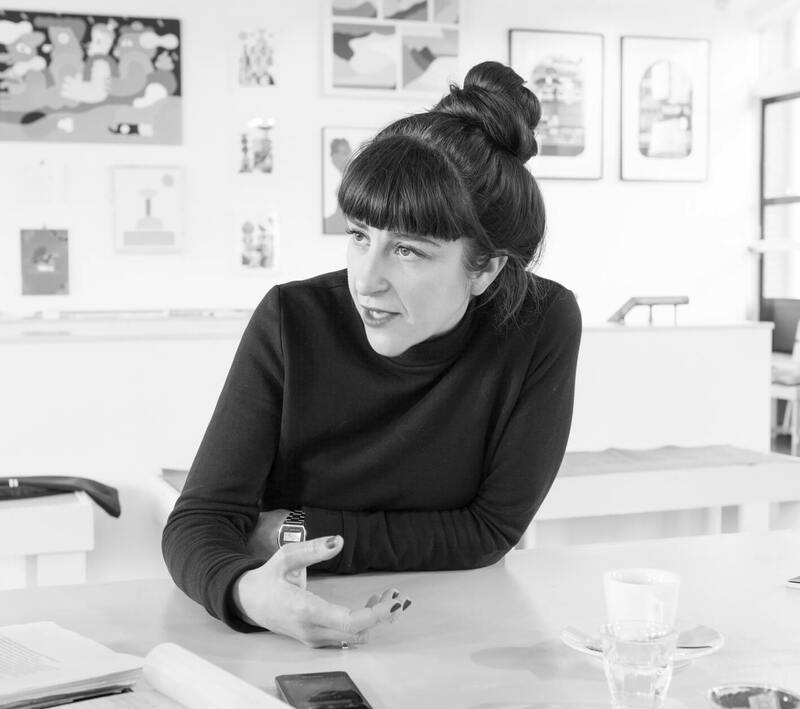 Connecting art, culture and residents with (cultural) production, economy and urban development is the basis of her work. With a series of projects, Freehouse works on an inclusive, integral development of an area in the south part of Rotterdam (NL). It tests and creates new forms, new models for organizing a neighborhood and the city. In 2013 Freehouse founded the Afrikaanderwijk Cooperatie, a cooperative on the scale of the neighborhood. The cooperative creates opportunities through the provision of skill-based labour, training, services, and products to enhance the self-organizing ability while trying not to waste talent and human capital. It stimulates sustainable local production, cultural development, knowledge exchange, and entrepreneurship, combined with shared responsibility and participation. The result is a self-organized and self-run body that continues to create local, self-produced economic opportunities, leverage political power to shift policy, and negotiate economic advantages. It also develops local skills and self-certifications, strengthens resilient intercultural networks, and tries to create a radical form for self-governance of an area and reinvest profits directly into the local community. 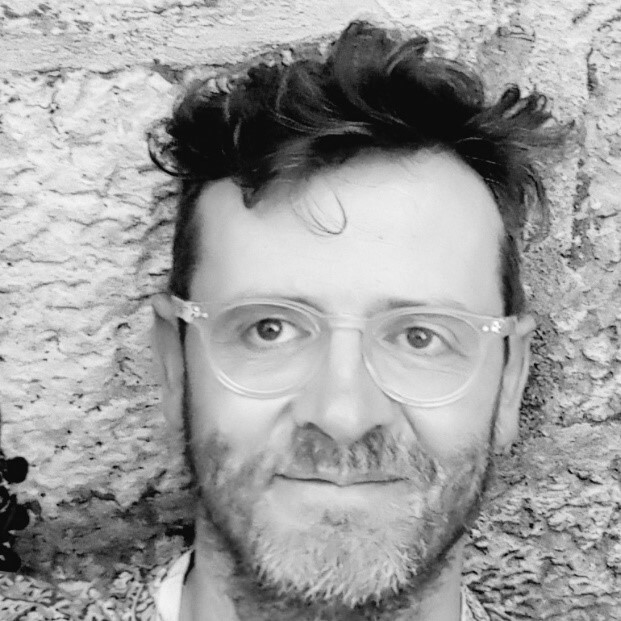 Neil McInroy is CEO of CLES – UK’s leading independent think and do tank, realising progressive economics for people and place. CLES’s aim is to achieve social justice, good local economies and effective public services for everyone, everywhere. At present he is focused on applying a progressive economic model for places. A key element of this are ideas around local wealth building, and progressive public procurement. This includes work in dozens of localities across the UK. Neil has been commissioned and collaborated, with a broad range of local, regional and national governments and agencies across UK and in Europe, Asia, US and Australasia. He is an Honorary Fellow at the Manchester Urban Institute, University of Manchester, and a Visiting Fellow at Edge Hill University. Neil will outline how the economic development mainstream is failing to ensure that economic gains and wealth are delivering socially or at scale. Poverty, wage stagnation, underinvestment, low productivity, and widening inequalities of income and wealth, are now entrenched features of many local economies. He will introduce Local Wealth Building as a new movement to address this problem. He will reassert how wealth is a defining feature of all economies and how Local Wealth Building is a practical systems approach to economic development: an approach in which anchor organisations, procurement, local roots and plurality of ownership are key. In local wealth building, social, and environmental gains are not an afterthought, but rather built in as an intentional function of the economy. He will then introduce the work of the Centre for Local Economic Strategies (CLES), with case study examples from across UK and Europe. In this lessons for Slovenia and local agencies and municipalities will be drawn.